Jesuit of New Orleans and the Bayou Hurricanes will fight it out for the Louisiana Boys HS state title after both won semifinals over the weekend, but those victories were as different as could be. The Hurricanes won in dramatic fashion over Brother Martin, while Jesuit shut out the NOLA Barbarians in convincing fashion. Brother Martin started strong against the Hurricanes, camping out in the Hurrcanes' half for most of the first 20 minutes. The Hurricanes defended well but Brother Martin did come away with two penalty goals for a 6-0 lead. Things started to change a little after that, as the Hurricanes made some inroads and then moved the ball through the hands to Jansen Folse, who scored the first try of the game. That made it 6-5, and that's how the first half ended. Early in the second half, Reece Guidry went over for the Hurricanes, and with the conversion by Gabriel Cardenas, Bayou led 12-6. Brother Martin answered, scoring two tries to take a 16-12 lead with less than ten minutes to go. The Hurricanes needed one more shot, and got it. After Brother Martin started to concede penalties, Guidry went over for his second, putting the Hurricanes ahead 17-16. Bayou retained the restart and ran out the clock to end it. As for Jesuit, they beat the Barbairnas 55-0, almost mirroring an earlier 55-3 regular-season win over NOLA. The Blue Jays play a fast and aggressive style and have benefited from some solid work from Jack Juge, a senior in his first year of rugby who has shown an ability to exploit space. Payers such as Cole Radetich and Caden Pretlove have stepped in when needed, while senior Byrne Muser has been superb in hte lineout. Spare a thought for Brother Martin. 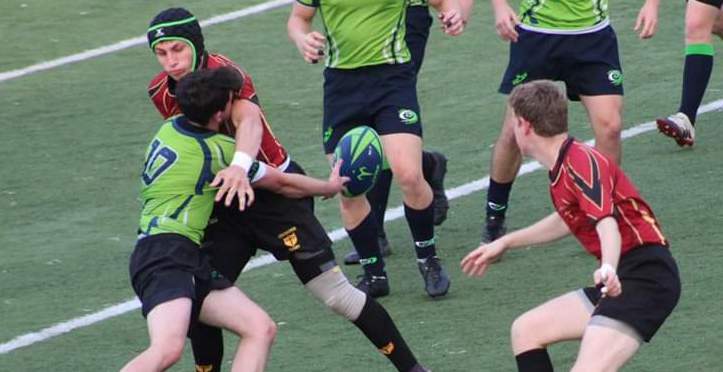 The single-school team was a try short against Jesuit a few weeks ago and already had beaten the Hurricanes. They ended just a point out of the final, and will play the Barbarians for 3rd April 13. The Hurrcanes take on Jesuit in the final on the same day.